The Israel Philharmonic with conductor Omer Meir Wellber, 34, has been named orchestra in residence at the 2016 Dresden Music Festival in May-June. Other ensembles involved in the festival’s Israel-Germany theme are the Jerusalem Quartet and the German-based New Jewish Chamber Philharmonic, which performs works banned by the Nazis. For its 39th festival programme, the Dresden Music Festival has taken as its motto “Time”, whose various facets will be examined from 5 May to 5 June 2016 in 52 concerts given by some of the most renowned figures in the international classical music scene such as Leonidas Kavakos, Andris Nelsons, Kristine Opolais, Pierre-Laurent Aimard, Daniil Trifonov, Arabella Steinbacher and Semyon Bychkov, to mention just a few of the performers who have been invited. Good signal for the pegidians. Oh my, what will the “refugees” think? 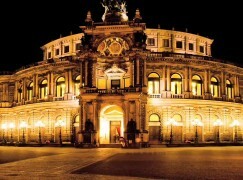 So the most racist orchestra in the world is invited to Dresden. Actually it makes sense. Racist orchestra? Lol. I think we know who the racist is PETER. They are the most humanity – based orchestra in the world. This blog is full of racists. And if you don’t like a government’s actions, you blame their orchestra? Very mature Peter, very mature.